Studio synopsis: Get ready for an adventure of many lifetimes, with the ground-breaking sci-fi classic, Quantum Leap. With the complete series box set, you can now leap through all 95 thrilling episodes over 5 seasons of this Primetime Emmy Award-winning series, back-to-back and uninterrupted. The vast majority of the original music has been restored for our release! Join Dr. Sam Beckett (Scott Bakula), a time traveler lost in time, who temporarily leaps into the bodies and lives of other people to "put right what once went wrong." Accompanied by Al (Dean Stockwell), a wise-cracking holograph that only Sam can see and hear, Sam twists the hands of fate with each heart-pounding, action-packed adventure in the hopes that he can someday complete the mission that will take him home. Winner of 6 Emmy Awards, and nominated for 26 additional awards. Ranked #15 in TV Guide's list of the "25 Top Cult Shows Ever" The series traces its roots to the original Battlestar Galactica, which Donald P. Bellisario wrote and produced for. Stars Scott Bakula and Dean Stockwell both won Golden Globe awards for their performances in this hit series! Includes hundreds of celebrity guest stars including: Jennifer Anniston, Neil Patrick Harris, Teri Hatcher, Joseph Gordon-Levitt, Michael Madsen, Jason Priestley, Bob Saget, Brooke Shields, and Dr. Ruth Westmeimer. Was not sure this day would ever come! Kind of annoyed Mill Creek has been so silent on their plans. When the DVDs first came out from Universal I only bought season 1 and 5 because those did have the original music. I work at Walmart and finally bought season 2 a couple years ago because it was $10. Than only last month I bought Mill Creek's season 2 release for only $5 because it does have the original music. I wish I had waited now! I guess this explains why Mill Creek had not released the whole series on regular DVD. They have been waiting for a same day release for when the Blu Rays were ready. I did not spend that much money and will certainly buy the complete series on Blu Ray. I have heard Mill Creek Blu Ray releases are good. I hope so because their DVDs are low quality. Watching their season 2 great to hear the real music but the picture quality is very substandard. They cram too many episodes to a disc and the image suffers. I hope their are early reviews for their Blu Rays before it comes out. Agreed on all counts. I refrained from buying the MC dvds for that reason. I hope that (good) reviews preempt the release. Did some math. It's an 18 disc set, so the likelihood is that there will be at least 5 episodes each disc, and sometimes more to fill the 22 episode quota. There will definitely be some episode cramming. On blu-ray it can go farther, but I now no longer expect true HD. As long as they manage to get slightly better than standard definition with music and no cropping, it'll still be worth the price of admission, but I must admit I'm now skeptical. I've got all the episodes downloaded in HD from Amazon and the music is all intact. Guess we'll see what exactly they mean. On a U.K. based Blu-Ray forum a member already got a copy. Did anyone who preordered it here get your copy yet? They did not have a chance to post a full review yet. They looked at the first disc and were very impressed by the picture quality! I have not ordered it yet. Though I am tempted too. All I care about is cropping and the original music, to be honest. If the picture quality is a bit better then the DVD, that's a bonus, but we're talking broadcast TV from decades ago here. It's not going to be high fidelity or crystal clear by any means unless they over-process it, which might cause its own problems. Someone mentioned possible issues with cropping in a previous thread though. Is that an issue anywhere? Are "Trilogy" and "Mirror Image" presented as originally broadcast on the Blu-ray? Were these two fifth-season episodes, and "Play It Again, Seymour" (great to hear the opening title sequence has been restored), the only ones that differed on the Universal sets? OK I've just taken a look and M.I.A. certainly has a grain problem in the evening scenes with Beth and Al. Dark areas almost resemble a snowstorm when it gets really dark. It looks like they brightened up the entire series a couple of clicks on the Blu-ray vs. the iTunes release, which makes the grain problem more relevant in dark scenes. They should have used some light noise reduction and possibly pushed dark colors down for M.I.A. Specific to this episode, it looks like the cameraman had a tough time keeping things in focus so there are times when Dean's face is slightly blurry. In well-lit scenes and especially outdoors, the picture quality of Quantum Leap on Blu-ray is good to excellent. Overall, I think for a Blu-Ray of a TV show from 1989-1994, this is respectable and I am not at all disappointed in the quality. I do wish they'd reconstructed a "best version" of the different Saga Sell and Main Titles sequences by going back to source materials. Some of the clips used are a copy of a copy of a copy and it shows. As for the cropping, yes it's different from the DVD/broadcast. It's not a huge change. When the show originally aired, I'm guessing the Director of the episode supervised the prints and made slight adjustments (up, down, left, right, cropping tighter or relaxing the cropping). Since Universal re-scanned the 35mm film for every episode for the iTunes/Amazon/Mill Creek releases, they likely just used a fixed position for the entire reel of film. It's not anywhere near as bad as the first release of Back to the Future II on DVD which was a new film scan. The cropping on that was off by up to 40% in some scenes. They did a re-release to fix it. The Saga Sell and Main Titles for Quantum Leap episodes are sourced from the episodes "as edited". 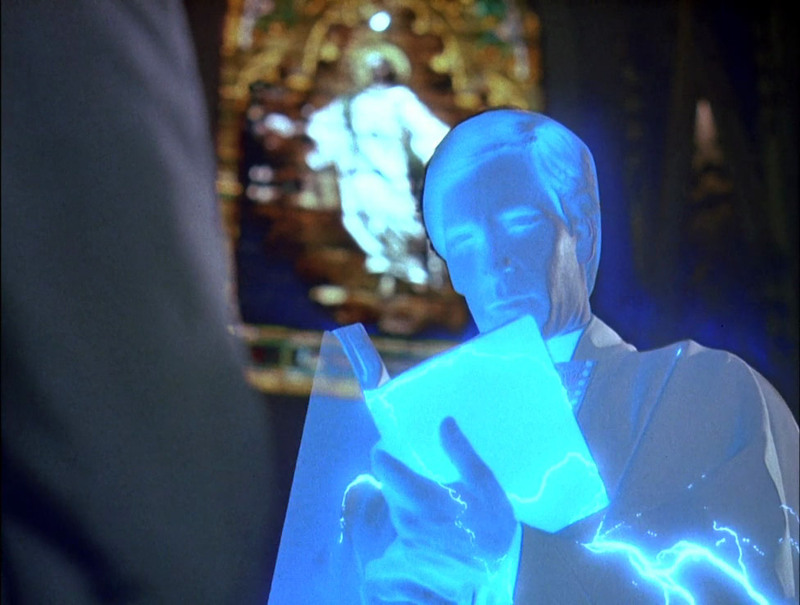 As Quantum Leap was edited on film before the advent of high definition editing on a computer, all the clips in the intro sequences have been copied many times. This generation loss results in a grainy low resolution image and lots of gate jitter (the picture wobbles up and down). So today I got bored and I have recreated the Season 3 Saga Sell by sourcing each clip from the original episode it is from. It took a bit of jockeying on the leap-in from Genesis. And I was unable to replace the 2 scenes of Sam in the Accelerator Chamber. Apparently the clips used in the intro are from a different "take" than what exists in the Pilot episode, so a simple one-for-one replacement is not possible. As Feldon says, the BD is sourced from the same newer HD scans used on iTunes and for the Mill Creek DVDs, so same cropping. I'd add though that Troian is the worst affected by far, so don't let my post put you off too much - most of them aren't noticeable unless you line them up. BTW, Morgan - fantastic job on the saga sell reconstruction. I've been wishing they'd do that every time they re-release this show. Sigh! Just to say, I don't think the issue you're describing with the MIA scene is to do with the BD mastering, but rather happened at the HD scanning stage. I agree that in some scenes the black levels are off, causing a lot of dust to show up (the Georgia scene being one of the worst offenders), however downloading them isn't the answer. The iTunes versions are near enough the exact same (albeit very slightly darker). I realise I'm splitting hairs here, but it would be unfortunate for someone to go off and buy the streaming versions expecting them to be better. From what I can tell so far, all HD versions (Aus BD, US BD, online streaming versions, ITV HD - and even the Mill Creek DVDs which are sourced from the same scan - suffer the same problems throughout) - but really, they're all damn good for the most part. I'm certainly very satisfied with what I've seen and they're the best of the HD versions out there due to their increased bitrates (with apologies for the jpeg compression in the below grab, which paints the discs in an unfairly poor light - I'm just trying to point out the shared issues with black levels). EDIT TO ADD: Just checked, the other glaring issue with the HD transfers to date (including iTunes etc) has been that the leap-in during Hurricane turns green in error. This mistake is still present on the Blu-ray. I think we can be pretty confident that the Mill Creek BDs share the same master as all other HD releases so far. I am already up to What Price Gloria in season 2 and I only got it Tuesday. Plus a few random episodes I checked out before I starting watching from the beginning. I have never seen the show look or sound this good... EVER. The issues mentioned are really very minor. It really shows how high the production values were every week. In terms of locations and costumes, details I never noticed before. It really feels like they produced a new movie every week. Thank you MattDale. Yes, it really comes down to they punched up the brightness on the Blu-Ray a few degrees across the board and didn't take any care of darker scenes. Considering the widespread availability of color correction and noise removal software available these days, it's truly a shame that they didn't make any effort to improve things. Another glaring example that is seen in the intro of EVERY 4th season episode is a duff matte line on Sam's leap-in to "Thou Shalt Not...". Once you see it, you can't not notice it. If I do the Saga Sell for Season 4, I'll fix it. The show is probably as good as it's ever going to look. But they could have done so much more. Some episodes are okay, but others are really... really bad. Catch a falling star was REALLY awful in parts, namely the starting bits. What's the music situation? What's still missing? I Want To Know What Love Is? Thanks for the reply and sorry for my late response. So, I Want To Know What Love Is is in Temptation Eyes and Jailhouse Rock is in Rebel Without a Clue? I had kind of planned to just keep my Vudu seasons, but I think I'll have to get the Blus now. After all, what do you do if Vudu is suddenly no longer around? "I Want To Know What Love Is" is absolutely there in Temptation Eyes. Be aware that the Blu-rays are brighter in certain scenes which can be a problem if there is a lot of film grain. Also as mentioned there were framing problems in certain episodes like A Portrait for Troian. Wow! They should have shouted this from the rooftops! I think I can live with those problems with fully intact music. I wonder if there are any rights issues with Disco Inferno, which was the only episode Netflix didn't carry at the end of their carrying the show at all.